The very first footage from Toy Story 4 just debuted online! 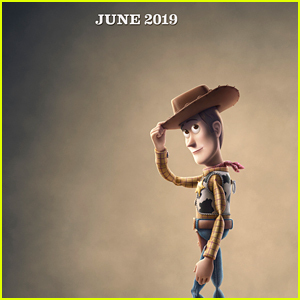 Here’s a brief synopsis of the new Pixar film: Woody has always been confident about his place in the world and that his priority is taking care of his kid, whether that’s Andy or Bonnie. But when Bonnie adds a reluctant new toy called “Forky” to her room, a road trip adventure alongside old and new friends will show Woody how big the world can be for a toy. The film will be released on June 21, 2019. FYI: Mandy is wearing a Proenza Schouler dress and Malone Souliers shoes. Oprah Helps Honor Tom Hanks & Rita Wilson at Ambassadors for Humanity Gala! 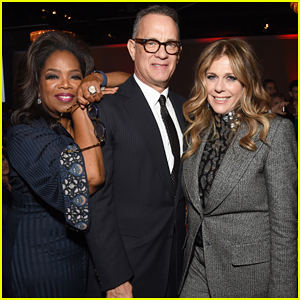 Tom Hanks is all smiles as he poses in-between Oprah and his wife Rita Wilson at the 2018 Ambassadors For Humanity Gala Benefiting USC Shoah Foundation held at The Beverly Hilton Hotel on Monday (November 5) in Beverly Hills. Steven Spielberg, founder of USC Shoah Foundation – The Institute for Visual History and Education, and his wife Kate Capshaw presented Tom, 62, and Rita, also 62, with the Institute’s 2018 Ambassadors for Humanity Award. Tom and Rita are champions of many vital efforts, they have been steadfast supporters of USC Shoah Foundation for more than two decades, helping to further the Institute’s mission to develop empathy, understanding and respect through eyewitness testimony. 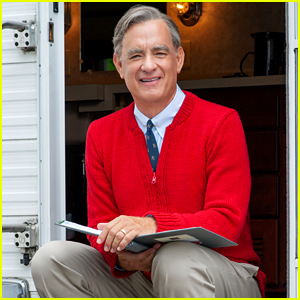 Tom Hanks as Mister Rogers - First Look Photo! Tom Hanks is set to play Fred Rogers, aka Mr. Rogers from the popular children’s series, in an upcoming film that does not have a title – and we have a first look photo! Here’s a synopsis of the movie: After a jaded magazine writer Tom Junod (Matthew Rhys) is assigned a profile of Fred Rogers, he overcomes his skepticism, learning about empathy, kindness, and decency from America’s most beloved neighbor. The film, which is currently in production, was originally thought to be called You Are My Friend. Susan Kelechi Watson and Chris Cooper also star. Cardi B Joins Henry Golding at Tom Ford NYFW Show! Cardi B strikes a pose as she arrives at Tom Ford’s New York Fashion Week Show on Wednesday night (September 5) at the Park Avenue Armory in New York City. The 25-year-old “I Like It” rapper showed off her post-baby body in a curve-hugging black gown as she was joined at the event by Crazy Rich Asians hunk Henry Golding. Other stars that stepped out for the show included Adriana Lima, Tom Hanks and Rita Wilson, Suki Waterhouse, Hailee Steinfeld, Gina Gershon, Riley Keough, Elizabeth Chambers, Michiel Husiman, Russell Westbrook, and Abbey Lee Kershaw. FYI: Cardi is wearing a Tom Ford dress and Giuseppe Zanotti heels.